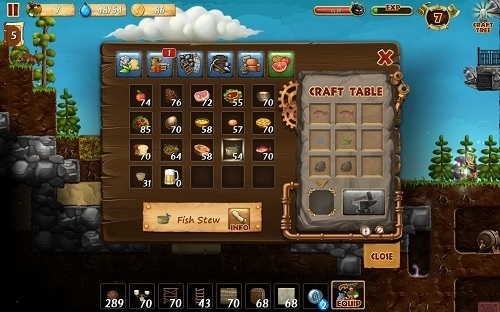 Craft The World is a sandbox game with strategy elements for PC, Mac and iOS. Borrowing elements from the likes of Terraria and Dwarf Fortress you’re definitely in for a gaming treat. 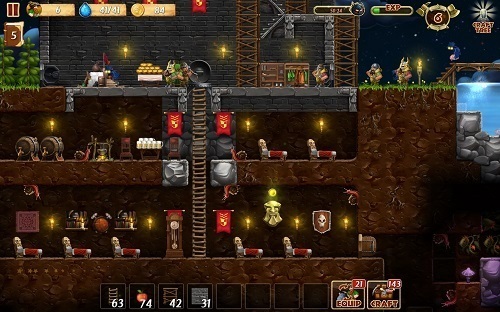 Craft The World puts you in charge of your own dwarf society that grows from a single dwarf to a thriving community of adventurers as you explore the randomly generated game worlds, collect resources, fight monsters, craft items, discover new technologies and much more. The game features several different levels for players to playthrough that offer different challenges with varying world sizes and access to resources. These levels are all randomised and with a sandbox option also available there is definitely no shortage of replay value on offer in Craft The World. At the start of each adventure you’ll start with a lonely dwarf and adventure out to collect the necessary starting resources such as wood, food and stone. If it’s your first time jumping into the game you’ll be able to follow the tasks that are provided to help you get started. Ordering your dwarves is as simple as clicking on the tiles that you wish to dig out but you can also take direct control of a single dwarf if you desire greater control over their actions. Using these basic resources players will be able to craft their first few items which will include torches, clubs and pickaxes. This is done through the crafting screen which gives you information on all the items you have and shows you any recipes that you currently know. To learn more recipes you’ll have to work your way through the technology tree which features a huge amount of craftable items. As you craft new items you’ll unlock new recipes in a tech tree style fashion so it’s easy to see the path to the unlock that you want. Equipment based items such as tools, weapons and armour must be equipped to individual dwarves allowing you to design fighters and workers to meet your needs. Dwarves also come with their own specialised skills such as cook, mage or hunter which is important to consider when decking out your dwarves with gear. Staying geared is important as there are countless threats waiting in the darkness that love to attack your settlement. Craft The World takes the sandbox genre into a slightly different direction but proves to be an extremely enjoyable, deep and rewarding experience. Grow your dwarf population and thrive in a randomly generated game world. Equip your dwarves with weapons, armour and tools to complete their jobs. Gather resources and craft from a huge list of recipes. Defend yourself against a variety of threats.